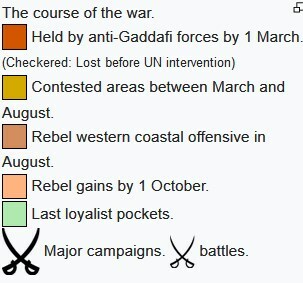 Libya’s uprising began very much like the others. Qaddafi’s portrayal of his opponents as al-Qaeda inspired Islamists did not match the reality of a broadly based civil uprising. Courageous activists inspired by Tunisia and Egypt began to plan their own nonviolent protests using an already familiar mix of online and offline mobilizational tools. They selected February 17 as their revolutionary moment, and presented themselves as organically part of the broader Arab uprising which fit comfortably in the narrative of a regional revolutionary wave. These protests changed to war almost immediately, without the long soul-searching and divisive argument which would soon consume the Syrian uprising. The early days of the war offered a bewildering but exhilarating spectacle of “do it yourself” armed rebellion. The Arab media’s transition from the cheering crowds dancing in Tahrir Square to the war footage was jarring. Flush with the impossible victories over Ben Ali and Mubarak, the mobilized Arab public had come to expect the once unthinkable. Footage of rebels commandeering pickup trucks and carrying out lightning raids against Qaddafi’s forces thrilled Libyans and foreign audiences alike. But those images were misleading. Qaddafi’s military had an overwhelming power advantage, which it rapidly brought to bear against the rebellious regions. The early gains of the rebels were quickly erased, as Qaddafi’s armor steadily advanced. By early March, his forces had pushed to the outskirts of Benghazi. The Arab push for intervention in Libya is one of the more remarkable moments in recent regional history. Since the founding of the Arab League, the regional order had been grounded in the principle of state sovereignty. This did not prevent competitive interventions, obviously, as the history of the Arab cold war of the 1950s makes abundantly clear. But direct cross-border invasions or overt military interventions were exceedingly rare in Arab politics. Egypt’s intervention in Yemen in the 1960s and Syria’s very brief incursion into Jordan in 1970 were among the very rare exceptions to this rule prior to Saddam Hussein’s shocking invasion of Kuwait in August 1990. His violation of that foundational norm of Arab politics was invoked repeatedly to mobilize Arab support for the coalition to liberate Kuwait and the war which followed. That norm weakened slightly in the following years, particularly with episodic Saudi campaigns against the Houthis in Yemen in the mid-2000s. But in general, the norm held. Indirect subversion remained the coin of the realm, while direct interventions remained infrequent and controversial. The call for intervention in Libya violated another core norm governing Arab politics: opposition to Western intervention. While many Arab states had supported Operation Desert Storm in order to restore the Kuwaiti royal family to the throne, even this had been broadly unpopular with publics outside the Gulf. Arab hostility to Western military action and to the United States more broadly had spiked over the previous decade. Arabs loudly condemned America’s 2003 occupation of Iraq, support for Israel’s 2006 war with Lebanon and 2009 war on Gaza, and the War on Terror. The Arab League’s invitation to NATO to intervene militarily against one of their own was thus revolutionary. So was the general (though, certainly not universal) Arab public embrace of that war. How could Qatar and the Arab League have gone from decades of near-universal denunciation of American intervention to a resounding public embrace of a NATO air campaign? The common explanation for the invitation to NATO and the direct Arab military intervention was the extremity of Qaddafi’s brutality towards his own people. But, as the Bahrain campaign amply attested, the Arab regimes were hardly in a position to complain of such things given their own fiercely repressive ways. Arab states had shown little concern over Saddam Hussein’s late 1980s genocide against the Kurds or Hafez al-Asad’s leveling of Hama in 1982. Every Arab regime maintained power through an extensive security apparatus which employed variable degrees of brutality against its own people. To be blunt, refraining from violence against one’s own people was not and had never been a widely accepted norm governing Arab political order. Qatar’s voice was the loudest in the mobilization of the Arab League in support of intervention. It took the driving role behind the unusual GCC activism on Libya, framing it as an intervention in support of, rather than against the regional uprising. Al-Jazeera, like Qatar’s official diplomatic rhetoric, emphasized its continuity with the other regional protests. This fit well with the generally enthusiastic support for the uprisings from Qatar, uniquely among the Gulf states. More surprising, perhaps, is that the Libya intervention initially became a vehicle for GCC cooperation rather than competition. Qatar, the UAE, and Saudi Arabia were initially on the same side, mobilizing their distinctive resources against Qaddafi and in support of the rebels. This unity did not last. As in Yemen, Egypt, and Tunisia, they were competing with each other from the start for influence with power brokers in the anticipated new Libya. The competition for rebel proxies in Libya helped to ensure that its transition would fail, and it set the stage for even worse to come in Syria. For most of the external players, the initial choice of proxies was mostly a question of availability and convenience. Both Qatar and the UAE relied heavily on the networks of expatriates who happened to be resident in their countries as political exiles or businessmen from previous years. The Libyan journalist Mahmoud Shammam, who had happened to be involved with al-Jazeera and other Qatari media ventures in previous years, convinced Doha to support a pro-revolution television channel, which started to air almost immediately. Arif Ali Nayid, a Sufi cleric and telecoms magnate, played a similar role in Abu Dhabi, serving as a key contact point for Mahmoud Jibril to develop a network for funding and arms shipments from the UAE to compete with Qatar’s. Meanwhile, Turkey worked primarily through the Libyan Muslim Brotherhood but also engaged with more radical figures associated with the Libyan Islamic Fighting Group. In Libya, as elsewhere in the region, the historical presence of important Brotherhood figures in Qatar created a ready-made network upon which to draw. Muslim Brothers fleeing Nasserist repression in the 1950s and 1960s had played a crucial role in the construction of the Qatari state and educational system. The Muslim Brotherhood’s Yusuf al-Qaradawi featured prominently on al-Jazeera’s programming. It was not just Muslim Brothers, though. As Qatar rapidly expanded its diplomatic presence in the region during the 1990s and 2000s, it had positioned itself as a bridge between the competing camps and able to facilitate talks with anyone. Al-Jazeera played a useful role here, with invitations to appear on the station providing opportunities for Qatari officials to cultivate relationships with a wide range of political figures, intellectuals and activists. For instance, Ali Sallabi, Qatar’s key point of entry into Libya, was an Islamist who had run Saif al-Islam al-Qaddafi’s controversial deradicalization program and was friendly with al-Qaradawi. His regular appearances on al-Jazeera made him familiar to Qatari diplomats, while allowing him a privileged place in shaping regional understanding of events in Libya. Qatar and the Arab League mobilized both publicly and behind the scenes. The public face of the Gulf efforts came at the Arab League and the United Nations, and then the inclusion of its warplanes in the military coalition. On February 21, Ibrahim Dabashi, Libya’s deputy ambassador to the UN, resigned to great publicity and accused the Qaddafi regime of planning to carry out genocide. With very little media presence on the ground, his call for a no-fly zone and warnings of impending massacre shaped the international media coverage of unfolding events. Al-Jazeera filled in this gap eagerly, sending its own camera crew (one of whom would be killed in mid-March) and mobilizing an innovative network of citizen journalists to upload videos. An al-Jazeera report based on a supposed eyewitness to helicopter gunships shooting protestors from the air had an especially large impact, though those claims later proved difficult to substantiate. The Libyan rebels urgently needed a political body to represent them abroad. Qatar again took the lead, sponsoring the creation of the National Transitional Council. The NTC had been formed on the fly in Benghazi on March 5, with Mustafa Abd al-Jalil named its president and the membership made to represent all of Libya’s regions. Its leadership was dominated by a small group of Western-educated technocrats and early defectors, many of whom had been affiliated with Saif al-Islam Qaddafi’s reform initiatives in the year 2000. Such personalities had earned some measure of trust from Western governments. The NTC was almost immediately recognized by the international community as the legitimate interlocutor for the military campaign and as the recipient of aid via the “Friends of Libya” coalition. Its main role at first was to work with the international community to muster financial and political support and to secure a reliable flow of weapons from abroad. The speed and novelty of the international moves on Libya were frankly remarkable. The UN Security Council voted on February 26 to refer Libya to the International Criminal Court—only the second time it had ever done so, and the first unanimous referral of its type. The notoriously cautious ICC opened its investigation only five days later, and on May 16 issued arrest warrants for Qaddafi, his son Saif, and intelligence chief Abdullah Senussi for crimes against humanity. France recognized the NTC as the legitimate representative of the Libyan people on March 10, some two weeks after its creation. Qatar followed suit on March 28, with broader acquiescence from the rest of the GCC. The Arab League soon suspended Libya’s membership. This shift in international recognition came incredibly rapidly given that Qaddafi’s government continued to control more than half of the country. The international response rapidly moved towards military intervention. On March 12, the Arab League called on the UN to impose a no-fly zone as Qaddafi’s forces continued to advance, taking Ajdabia and moving rapidly towards Benghazi. On March 17, Saif al-Islam declared on radio that “in 48 hours, everything will be over.” This was followed, fatefully, by Qaddafi’s radio address declaring that the next day his forces would “cleanse the city of Benghazi . . . [W]e will track them down, and search for them, alley by alley, road by road.” The declaration of genocidal intent could not have been more perfectly timed for the supporters of the rebels feverishly seeking a Security Council vote for intervention. On March 17, the Security Council voted for Resolution 1973, authorizing “all necessary means” to protect Libyan civilians. Qaddafi halted his advance as he waited to see what precisely this meant, and announced his acceptance of a cease-fire. There is little reason to believe that there was a deal to be had at this point or that a cease-fire would have lasted more than a few days. On March 19, NATO began bombing. The initial air strikes had a powerful psychological effect on both regime and rebel forces. Benghazi celebrated rapturously, to the delight of Gulf and Western capitals eager for validation of their risky military venture. Many, perhaps, expected a rapid rebel victory to follow from the introduction of NATO forces into the conflict. But Qaddafi, predictably, did not fold. His forces quickly adapted to the threat of air strikes, moving away from easily targeted convoys and massed forces to a more dispersed deployment. This slowed the tempo of the battle, as regime forces sought to avoid NATO air strikes while rebels chafed against restrictive NATO rules of engagement. Air power could only accomplish so much, beyond stabilizing front lines and supporting the available forces on the ground. The United States had made clear that it would only operate in a support role, and that no ground forces would be forthcoming. The coalition forces rapidly ran low on obvious targets. They also, to Russia’s open consternation, quickly expanded their interpretation of the UN mandate from defensive operations to prevent mass slaughter to support for offensive operations and, ultimately, regime change. In Misrata, NATO support involved “precision air power, combined with the presence of foreign ground advisors working alongside the city’s defenders.” NATO targeting was tightly constrained by the UN mandate to protect civilians, leading to frequent clashes with and complaints from rebels who wanted more active and aggressive support for offensive operations. Obama, for his part, hawkishly watched for any hint of mission creep. But such restraint did not extend to the initial decision to expand the mission from civilian protection in Benghazi to support for the insurgency to topple Qaddafi by force. Quite early on, Qatari, UAE and NATO special operations forces became actively involved, embedding in rebel units to provide training and to call in air strikes. The presence of British and French Special Forces in Benghazi and Misrata was an open secret, as were the planeloads of Qatari weapons arriving by early April. These small numbers on the ground had an outsized impact. As Frederic Wehrey has explained in a comprehensive survey of the role of air power in the war, “[T]he presence of foreign ground advisors working with Libyan opposition forces had a transformative effect on air power. Libyan interlocutors described how, in the operations rooms of Misrata, Zintan, and Benghazi, these advisors built trust between Western forces and the opposition and—most importantly—coordinated air strikes.” The NTC and rebel leaders routinely met with Qatari, UAE, British, French, and American senior military officials to plan strategy, coordinate public messaging, and solicit additional support. These military operations centers and joint operations rooms would become a standard operating procedure to coordinate indirect military support operations in Syria and the other coming limited interventions. The decentralized and indirect nature of the intervention helped to bring about the proliferation of the militias, which would later come to plague the transition. Many of these militias were actually local defense forces, in cities such as Misrata, which became the primary vehicle for external support. Others came from wider political or ideological trends, whether Islamist, tribal, or ideologically affiliated. Connections to some outside source of weapons and funds was a vital currency for influence in this environment. Islamists affiliated with the Muslim Brotherhood or with the Libyan Islamic Fighting Group had considerable independent sources of funds and weapons from Qatar and elsewhere in the Gulf. Qatari and other Gulf-supplied weapons continued to pour in from Tunisia and through airlifts. Rebels frequently complained about the limitations of NATO bombing, inadequate supplies, and the other usual grievances. As the NTC began to evolve from a coordinating body for the international community into a proto-government in waiting, the struggle for representation and its relationship with the armed militias took on ever greater significance. The external powers jockeyed to get their people into leadership positions, leading to debilitating internal politicking at a time of urgent military threat. The NTC’s decision-making was typically opaque, given the primary focus on engaging international sponsors and the constant sense of crisis surrounding the revolution. The NTC’s members, many of whom were honest and competent, commanded little local constituencies or support on the ground. More liberal-minded Libyans wondered about the democratic legitimacy of a self-appointed and Western-backed council, while every faction and region which considered itself underrepresented demanded a greater share of seats. Meanwhile, questions about the true loyalties of defectors and rumors of corruption circulated wildly through the unregulated new media. Finances were key for the NTC’s viability and legitimacy, and international players were central to this dimension. On March 29, with the support of the US and UK, Qatar took the lead in organizing oil sales for the NTC, facilitated a line of credit in order to ensure its solvency, and began direct cash transfers in late June. In June, Turkey stepped in, transferring $100 million in cash and a similar amount of humanitarian aid directly to the NTC. It was followed by cash transfers from Kuwait and Bahrain. Finally, on July 15, the US also recognized the NTC and allowed the release of some $400 million in frozen Libyan assets. Weapons too were a vital currency. On March 22, in a meeting in Doha, Qatar agreed to supply the Libyans with a shipment of weapons. This commitment was made public on April 13 at the Contact Group meeting in Doha, and the next week shipments directly to Abd al-Fattah al-Younes, rebel military commander, from Doha began to arrive. In April, however, these arms shipments began to flow directly to Tubruq via Sallabi’s Islamist networks, bypassing the NTC structures and infuriating Younes. Qatar also worked through local Misrata networks, often flown directly to the front lines and directed towards individuals with Qatari personal connections. Jibril and Nayid, in turn, began to rely more heavily on direct weapons flows from the UAE. The same competition applied with joint operations centers and the coordination of the air war: Qatari forces embedded with key Islamist battalions, while Emirati advisers supported the efforts of General Abd el-Salam al-Hasi and then, later, Mahmud Jibril’s faction. In July, this struggle threatened the survival of the rebellion itself. Younes, the commander of the rebel forces, had defected on February 22 and played a pivotal role in organizing the nascent rebel forces and carving out a physical base for the insurgency. On July 28, he was killed in highly mysterious circumstances, throwing the rebellion into sharp internal disarray. The NTC survived, in part due to the success of the move into Tripoli, but in the interim the entire executive board of the NTC was fired and a transitional road map was adopted setting out the conditions for the NTC to dissolve itself upon liberation. Even as the war against Qaddafi raged, the militias associated with different external patrons were jockeying for position within the expected post-Qaddafi Libya. Once NATO entered the fray, Qaddafi’s eventual defeat was almost universally expected. This reduced the urgency of cooperation among the rebel factions and increased the political stakes over seats on the National Transitional Council and control over access to weapons and other resources. This infighting, along with the resilience of the Qaddafi forces and the limitations on the mandate for NATO intervention, prolonged the conflict dangerously. NATO governments were keenly aware of the propaganda implications of civilian casualties, and by the summer faced growing political pressure either to escalate or end the war. The air war bogged down, and frustration set in. The longer bombing went on, the greater the risk of a spectacular civilian casualty event, which could fatally undermine international support for the mission. The August 20 move into Tripoli, which unseated the Qaddafi regime, temporarily masked these emergent issues. This operation had been meticulously planned and largely implemented with Qatari, British, and NATO support. Rebels captured the presidential palace to delirious enthusiasm. Photographs of rebels planting the Qatari flag were met with somewhat less acclaim, particularly since the Tripoli operation had preempted a rival plan for liberating Tripoli developed by the UAE and Mahmud Jibril in early July. Both of these competing plans relied upon NATO involvement, each hoped to block the success of the other, and both played out to some degree during the chaotic moment of liberation. This would not be the last time that the Qatari-Emirati competition overshadowed decisive moments in Libya. This would become a constant refrain as politics polarized and militias carved out autonomous roles in post-liberation Libya. The networks, foreign linkages, and channels of influence which had developed during the course of the war continued to shape the course of politics. The celebrations, which greeted the Qatari flag when Tripoli was taken, soon faded as attention turned to post-Qaddafi institutions and power. The distribution of power among the militias and within the ruling councils were an artifact of those linkages, not a naturally occurring reflection of power on the ground. Access to sources of weapons and funds constituted real power in the institutional void which followed Qaddafi’s fall, and those with such access had little incentive to surrender it to the nascent state institutions. The refusal to surrender arms by these forces was not purely a matter of self-interest or ambition. In the violent transitional period, the state was in no position to guarantee their survival or to credibly guarantee against the re-centralization of power or predatory rule. The importance of these wartime networks was compounded by the relatively light hand of international forces in the reconstruction phase. The US had quite wisely ruled out any American peacekeeping force, while allies such as Britain and France, who had been expected to play such a role, failed to do so. Above all, Libya’s new leaders consistently rejected any international peacekeeping forces in the country. Their objections forced the United Nations to scale back even its limited August 2011 plan for several hundred armed military observers. This meant that it fell upon the victorious rebels and the external backers to build a new Libya from the aftermath of decades of Qaddafi and six months of war. The failure of the new transitional government to disarm or integrate the militias is now widely seen as the critical failure dooming the transition. In truth, it is difficult to see how they could have done so given the realities of power on the ground. The revolutionary brigades had played as much of a role in overthrowing Qaddafi as had the new government. They were locally popular and heavily armed. In comparison, the Libyan state had only minimal armed forces and much more limited access to military support from abroad. Many now argue that these problems might have been avoided had the United States been willing to deploy stabilization forces, either its own or from its coalition partners. 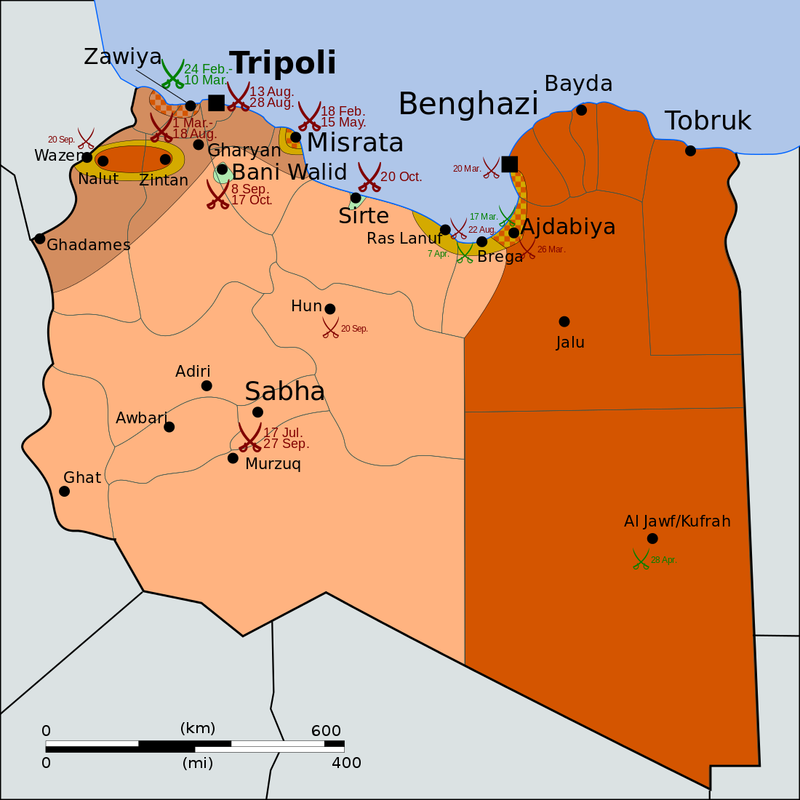 Few supporters of the Libya intervention called at the time for such peacekeeping forces, primarily because they knew that it would have been a political kiss of death for the campaign. The retroactive advocacy for such a force often seems to be more a matter of finding an excuse for the intervention’s failure which would not compromise future interventions. Even had it been possible, the idea that a stabilization force would have made the difference misses the many ways in which such an international military deployment could have gone wrong, without solving any of the deeper problems. An international force would have confronted the same array of heavily armed militias, forcing it to tread carefully. Its presence could have disincentivized rather than facilitated the creation of national security forces. It could easily have become a target for nationalist mobilization and Islamist attacks. And, once established as a vital guarantor of stability on the ground, it would have been virtually impossible to withdraw. The limited postwar international presence responded to the political demands of the new Libyan leadership and aligned with the preferences of the Obama administration. As the former White House coordinator emphatically put it, “Libyans had to shape their own future.” But there was never a moment when Libyans had the option of shaping their own future free of foreign influence. The regional interventions which had shaped the entire structure of the postwar political arena would continue with devastating effect. Libya’s course had direct and indirect effects on the region far beyond those originally anticipated. The intervention likely did, as promised, give a vital jolt of new energy to challengers in other Arab countries and give regimes pause as they considered the use of violence. NATO did get some credit for saving of Benghazi from its fate, although its actions would always be criticized as too little and too late. The positive effects did not last long, given the greater priority of urgent local considerations over calculations of possible international involvement, but they were clearly felt in the early stages. 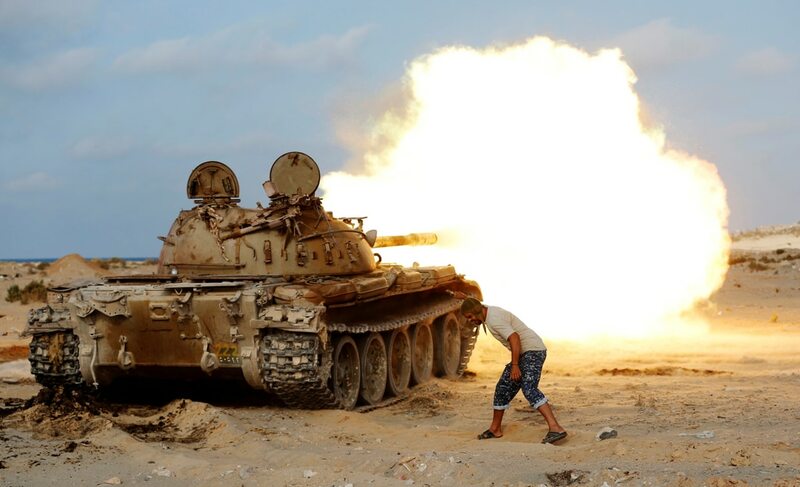 When the initial expectation of rapid victory for Libya’s rebels following the NATO intervention failed to materialize, the war consumed an enormous amount of Western attention through the end of the summer. Coordinating the international alliance, nurturing the nascent Libyan opposition, and running the war left less time for the complex political situations elsewhere in the region. The need to maintain the Gulf component of the Libya alliance bound Western hands when it came to other arenas such as Bahrain and Yemen. The sheer pace and diversity of simultaneous political crises overwhelmed the diplomatic agenda. The war directly impacted its neighbors. Refugees pouring into Egypt, Algeria and Tunisia affected local economies in both positive and negative ways. The neighbors became key organizational and transit points for the evolving rebellion. Meanwhile, the fighting left Libya awash in weaponry, great quantities of which would ultimately find a way into not only its neighbors but also into more distant conflict zones such as the Sinai and Syria. Libya was not the only regional playing field emerging over the summer of 2011. The key transitional cases of Tunisia, Egypt, and Yemen all involved significant and growing regional effects and interventions which shaped their transitional path—usually for the worse. This entry was posted in Wars by MSW. Bookmark the permalink.